Katrina Methot-Swanson was born and raised in the state of Nebraska. 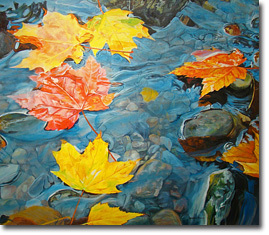 Katrina became interested in art at a very young age; she remembers watching her Mother paint and wanting to paint too. Fortunately, throughout the years, her parents encouraged her to pursue her art. She was first formally exposed to design and color concepts and the watercolor medium when she enrolled in a community college to pursue an Associate Degree in commercial art. From that beginning she taught herself to paint with watercolors and would wander around her neighborhood taking pictures of flowers and anything else that would inspire her. 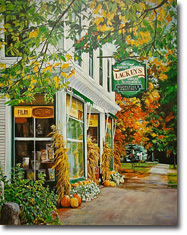 Katrina won several local art shows from 1991 through 1996 and was also a finalist of the Artist Magazine for their Cover Art Contest during that time. In 1997 she was selected as a Signature Member of the National Watercolor Society and won the Winsor Newton Award for her painting “Bumblebee Banquet”. 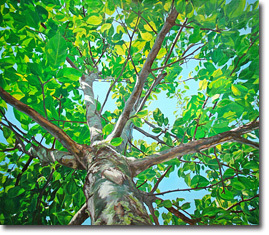 She has also been selected for several shows in the Kansas Watercolor Society and the Missouri Watercolor Society. The year 2003 was one of change for Katrina; she decided to master the medium of oils. Her subject matter and inspiration, however, didn’t change. She has always been interested in painting flowers because of their beautiful colors and autumn leaves with the sun shining bright and reflecting deep shadows and repetitive shapes. She continues to go out late in the afternoon when the light is most interesting, and walks the trails in a local forest or garden, taking photographs. Back in her studio she uses the photographs to help recreate the feelings she had while walking the trails. Through her study of art, Katrina has been inspired by a vast range of styles, from the great impressionists to the amazing realists of the 20th century. One cannot help but see similarities between her work and contemporary artists such as Chuck Close and Richard Estes….but with her own unique style and compositions in mind. She currently resides in the city of Omaha with her husband Paul, their children Shane, 6 and Liberty, 4, and two cats who always seem to be looking for affection right in the middle of a painting. Robert Paul Galleries is proud to be chosen to show the works of American artist Katrina Methot-Swanson.